Sightings of John Galliano's designs for Maison Margiela, the Parisian fashion house for which he became creative director in October 2014, are still rare. So it hasn't gone unnoticed that Amal Clooney has worn custom-made John Galliano for Maison Margiela twice - the only other people to have done that are Anna Wintour and Rihanna. Madonna, Doutzen Kroes, Sophie Hunter (aka Mrs Cumberbatch) and Cate Blanchett have all worn the former Dior designer's debut Margiela wares too, though only once. The pool of Galliano for Margiela wearers is therefore still very small and exclusive, no doubt a conscious PR move. Clooney first wore Margiela to the Met Gala, the fashion calendar's most high-profile annual event, earlier this month. The decision attracted some criticism; was it really appropriate for a human rights lawyer to be associated with someone who was found guilty of making anti-Semitic remarks? Nevertheless she chose Galliano for Margela again earlier this week to attend the Japan premiere of her husband's latest film, Tomorrowland. But now we know why - she has enlisted Galliano's long-term partner, Alexis Roche, as her stylist. Roche, a well-known stylist with clients including Marion Cotillard, Kendall Jenner and Liu Wei, has been proudly publicising his work with Amal via his social channels. Intriguingly, when Yahoo Style approached Maison Margiela for a comment regarding the budding relationship with Amal, a representative responded: "The Maison wishes not to speak on this subject just yet." "Just yet", now what could that mean? Hmmmm. 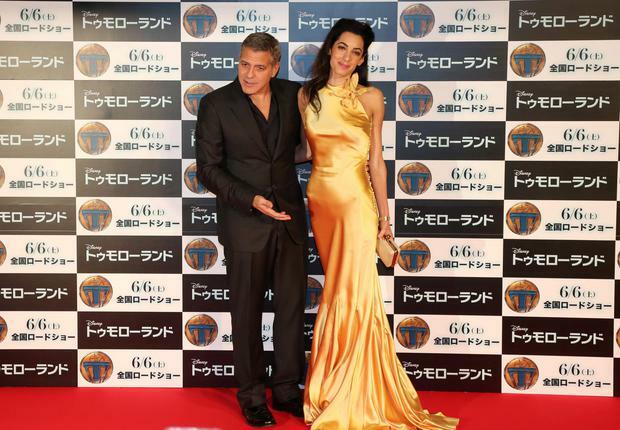 But whatever, Mrs Clooney seems like a very wise association for Margiela to cultivate.